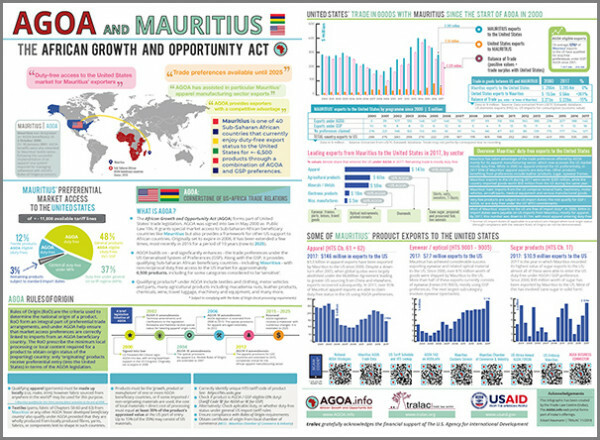 Since independence in 1968, Mauritius has developed from a low-income, agriculturally based economy to a middle-income diversified economy with growing industrial, financial, and tourist sectors. For most of this period, annual growth has been on the order of 5% to 6%. This achievement has been reflected in more equitable income distribution, increased life expectancy, lowered infant mortality, and a much-improved infrastructure. 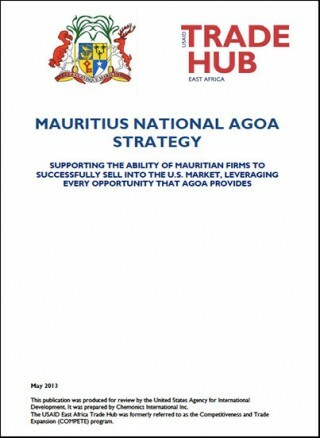 The economy rests on sugar, tourism, textiles and apparel, and financial services, and is expanding into fish processing, information and communications technology, and hospitality and property development. Sugarcane is grown on about 90% of the cultivated land area and accounts for 15% of export earnings. The government's development strategy centers on creating vertical and horizontal clusters of development in these sectors. 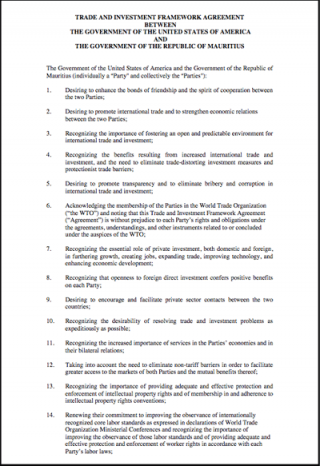 Mauritius has attracted more than 32,000 offshore entities, many aimed at commerce in India, South Africa, and China. Public Law 110-436 amending AGOA: (a) repeal of abundant supply provisions (b) designation of Mauritius as a country that may use third country fabrics in clothing exports. CONGRESSIONAL RECORD, Vol. 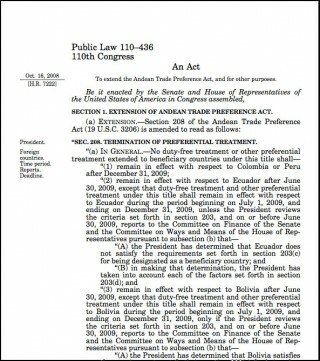 154 (2008): Sept. 29, considered and passed House. Oct. 2, considered and passed Senate, amended. Oct. 3, House concurred in Senate amendment. Oct. 16, Presidential remarks. 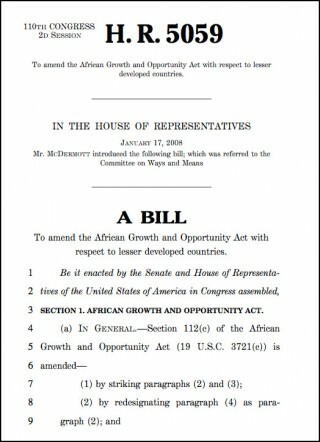 House of Reps Bill HR 5095 to amend certain parts of the AGOA legislation (specifically to include Mauritius as a country able to benefit from the apparel provisions with respect to using third country fabrics).